The following is the final summary report of Mars Desert Research Station (MDRS) Crew 176, the Polish team “PolMars.” A full review of this year's activities at MDRS will be presented at the 20th Annual International Mars Society Convention, scheduled for September 7-10, 2017 at University of California Irvine. 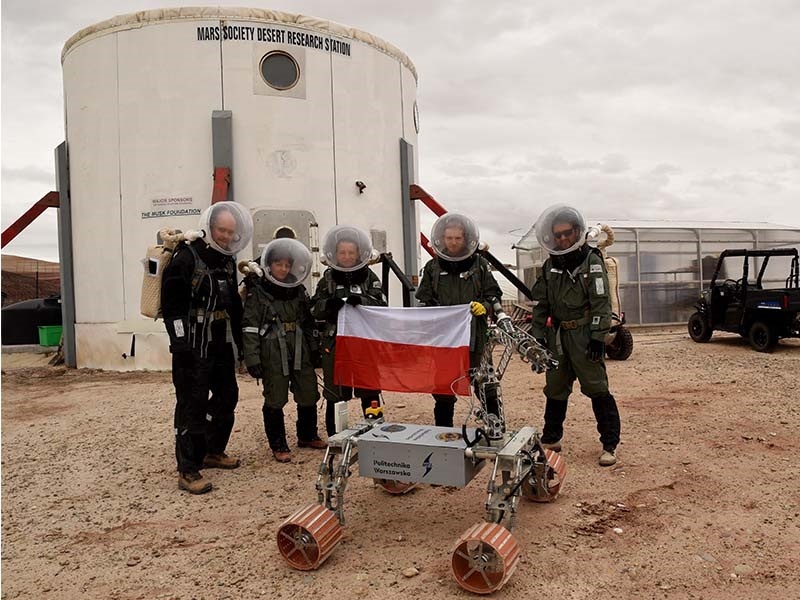 Crew 176 (PolMars) was the first entirely Polish crew at MDRS. Our simulation took place between 11-26 March 2017. Except for one person, all of us visited MDRS before, either on the occasion of the University Rover Challenge competition or as a member of the MDRS crew. Being here together as Crew 176 was an entirely new and unique experience for all of us. MDRS maintenance: Running and maintaining MDRS was a demanding but very useful task. It helped us to learn how to deal with limited recourses and unexpected malfunctions as well as successfully communicate with Mission Support outside the base. EVA: Undertaking EVAs was definitely the most exciting part of our simulation. This is also how we better understood what makes a good astronaut: endurance, basic driving and map reading skills, the ability to read topography and geology of surrounding terrain, resistance to stress and team spirit. Scientific research: Our research activities focused mainly on geology, robotics and psychology. The first two included fieldwork as well as conducting research in the laboratory settings. While research per se was not new to us, it was interesting to conduct it as part of simulation and learn how to divide our time between the research and maintenance-related activities. Technology testing: An important element of our simulation was testing different equipment and technological devices such as space suits, filter masks, holter monitors and a prototype version of the shower. We approached technology as part of a wider social context where different devices are used by human beings rather than constitute mere artefacts. Promotion: One of the major tasks during our rotation was creation of a screenplay and the corresponding movie set. The photographs we took were used in the social media. The videos will contribute to the short documentary movie which will serve as a case study, as well as will be used for the purposes of educational and outreach activities. The expected results include an increased interest in analogues simulations among the audience in and outside Poland. The most important finding of our stay at MDRS was that there can be no successful simulation and Mars mission without successful teamwork. It was the team as a whole that made the simulation possible, including the team members that supported us from Poland as well as Mission Support provided by the Mars Society.